In large bowl, mix all Lemon Mayonnaise ingredients until well blended; set aside. 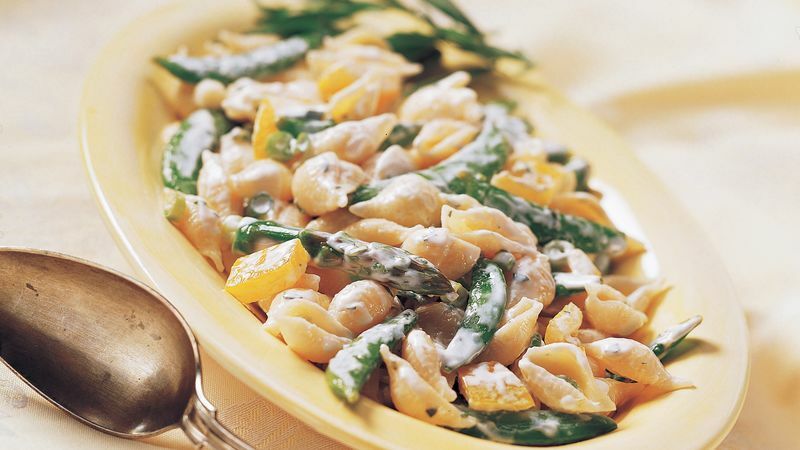 In large bowl, mix pasta and remaining Pasta Salad ingredients. Stir in Lemon Mayonnaise until well mixed. Cover and refrigerate 1 to 2 hours or until chilled. To blanch the asparagus and pea pods, plunge them into boiling water for 10 to 15 seconds or until they turn bright green. Remove from boiling water, then plunge into pan of ice and water to stop the cooking; drain. Leftover pasta salad? Toss in some cooked chicken or ham for a delicious main-dish salad.